I love interactive notebooks with my high school students! My students have never been more engaged and organized. 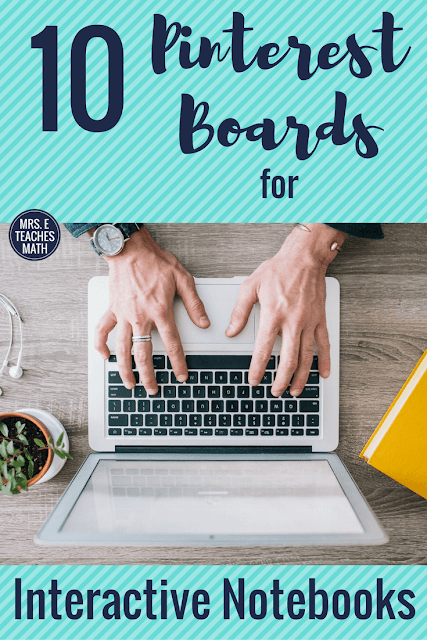 High School Math Interactive Notebooks by Managing and Motivating Math Minds - This board is a mix of all kinds of great ideas. Secondary Math Interactive Notebook Ideas - This board has several contributors and a variety of ideas for all high school math classes. There are even ideas for upper-level math classes. Interactive Notebooks by Scaffolded Math - There are some very unique flippable ideas on this board. Interactive Notebooks and Foldables by To The Square Inch - This is a collection of all kinds of foldables and activities. There are some great articles on this board. Flippables and Interactive Notebooks - Several contributors add ideas for all subjects to this board. It's cool to see ideas for other subjects and adapt them to math! Interactive Notebooks Math by Misty Miller - This board has lots of ideas for middle school math. Math Interactive Notebook by Math Idea Galaxy - Need some great ideas for middle school math? Secondary Math Interactive Notebooks by 4 the Love of Math - This board has mostly Algebra 1 ideas. Geometry Interactive Notebook by Mrs. E Teaches Math - So. Many. Geometry. Foldables. Algebra 2 Interactive Notebook by Mrs. E Teaches Math - There are so many Algebra 2 ideas on this board. I hope you discover a few new boards to follow!